March 11, a sunny hatless bowing day! What do I bow to today? How do I use my freedom of expression here in my adopted country on this Tuesday morning? An eye catching headline “Ukraine’s Ousted Leader Urges Military to Resist New Government” takes me back to 1968, when the Russian troops marched into Kosice, my hometown in former Czechoslovakia, to “save us; ” to save us from waking into the dream of being our own masters. I was then one of the “bandits,” this ousted leader urges to target. I remember how betrayed I felt, Tanks rolling through the main street, bullets flying. Later talking to some of the soldiers, clueless about what it was they were doing and why. The proverbial following of orders. Following prescriptions, looking for saviors. A smiling, wiry older man jolts me out of my reverie. We shake hands. Dean. He tells me he is 80. The energy he radiates is irresistible. This is exactly how I feel. I’ve been writing bitter poems lately because I’m so angry about how we’re behaving. Then he looks up at the pole behind me covered with staples. You see that? Each one of those is someone’s dream. A flyer they put up there, the dreamers. I guess that’s what I’m doing here today, acting on an image, a dream of sitting in a circle of beautiful bandits. Beautiful bandits birthing a human-type that intends no harm. I can’t help but see the radiating light that must have surrounded Dean and Julia on that special day, 3/11, one week ago. They understood each other –they spoke of dreams, and a better world for which we must all take a stand. 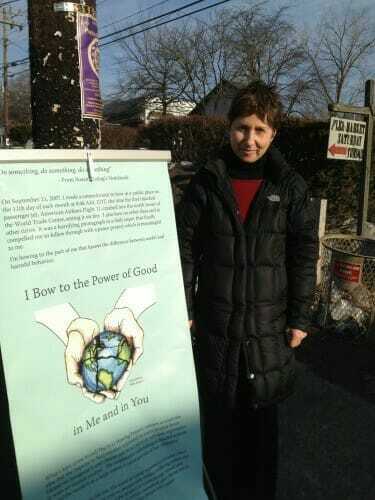 Julia’s mission, her fertile creations for humanity, impact us all. And I want to take each day, living in that fertile mission. And this is all so life-affirming. Julia, I am looking forward to your next bowing day now – you always meet wonderful people that give us some food for thought! This time the word “dreamer” caught my attention and took me to my childhood, where it had rather negative meaning. I used to be called a dreamer too, someone who spend hours “wondering in a clouds and wasting time”, or taking the most “twisted life path”. I guess I lived in the mentality of non-dreamers or those who were scared to think of a better life. It’s always easier to follow the established by someone set of orders – we don’t need to think, we don’t need to take responsibility for decisions. In this reality we are so busy fulfilling someone else desires that we forget about our own needs. Thank you, Julia, and all mamas for taking me back today to my dream, and although, this path of freedom feels often like a burden, it’s such a pleasure to think and act as the Captain! It does take courage to give ourselves permission to dream and then to take action and walk in the direction of our dreams. This practice is about strengthening our inner resources so that we can keep moving forward drawn by the images of our “dreams.” Thank you for joining the Fertile Heart dreamer/bandits, N.! This one blog got back so many hidden feelings out from my childhood. Now a days I fear most of the things, I think 100 times before I commit on something, sometimes even if it means everything to me, only because I chose to live in fear and didn’t have courage to take the next step. I wonder what made me to choose this path and on the other hand my cutie pie baby is bringing my original spark that got hidden and buried deep inside me. Acknowledging this truth and taking action towards leaving fear and moving forward is such a nice feeling. Your post reminds me of my student times. It was 1989 and I was 19. All students over the country, together with other people went out on the streets, for protesting against communist regime. This action would lead to the overthrow of the government. I was also there, not feeling the danger and not knowing how that December night would end. At the beginning, it was a simple protest that in a few hours turned into a serious demonstration. We were called BANDITS. Tanks and soldiers were moved in the street. I realized then, that the night was going to end badly. I looked in the eyes of some soldiers. They were young men ready to shoot us: following orders. And they did. I watched then, the same eyes and they were full of tears. The fear of (not)following orders was more strong than the voice of their soul. It’s a long story, part of the history already. The good news is that we have then released the frustration, pain and chains we were living for so long, and could fulfill our dreams lately. Freedom meant also the possibility of travelling abroad, which was very restrictive before 1989. So, dear Julia, thanks to the former “bandit attitude”, I had lately the chance to visit Kosice, and other lovely parts of Slovakia (Poprad, Liptovsky Mikulas, Vysoke Tatry). Thank you for reminding me all these, I think it’s also helping me to go back to my younger years as you suggested me a couple of times. Thank you so much for this, Frida, and I’m so glad that you’re doing a little “time travelling,” into your teen years. What a beautiful comment by the older gentlemen Dean! I also love the idea of being a bandit and taking back my hopes and dreams of bringing a child into this world from the authority figures ( and sometimes my own orphans) who can make statements that chip away at those wishes and dreams. I can’t imagine growing up and experiencing such life altering circumstances as you did Julia. I am grateful to you and all the other bandits who make the world a better place. Cheers to bandits and dreamers! I vote for that, Heather, for taking back our power and re-claiming our dreams! I loved the posting Julia but the part about the staples stuck to the light pole with people’s dreams really struck a cord. Reminding me of my first pinned up poster selling homemade lemonade for ten cents with a neighbor child. A sense of innocence, hope, and a dream! This memory and feelings I will remember especially when my anxious fearful orphans are foreshadowing my visionary. He was such a poet, Dean! I also love his comment about the staples and what a lovely memory to connect with! Thank you! I too love the bandit title! I have a bandit story: One of the lovely nurses I work with started a “Hope project” at the hospital I work at for the Oncology patients we work with. The project was to inspire all who work with the patients (social workers, nurses and yes even the physicians) to ask patients “what are you hoping for”. It is to really look at the word hope and let it be many definations. Not all patients have the same answer and being in oncology it really does bring up a lot of their different desires. Some “hope” to see their children graduate high school. Some “hope” to have a peaceful death in their home surrounded by loved ones. Some do “hope” for a miracle. The point is to allow them to identify what hope is to them. We have little cards with conversation starters for the medical professionals to carry in their pockets. There was a meeting where it was PACKED with physicians and nurses to listen to the HOPE talk. It was well received. I think because deep down that is what we really want to do in the medical field, connect more with our patients other than just throwing medications at them. So beautiful, Katy, thank you for this! Ha !! The moment I saw the key word in the blog “Bandit” I couldn’t stop myself from reading the blog, even though I was in the middle of something else Julia ! I could certainly feel how you must have felt when a bunch of soldiers did what they were asked to do without putting any brain on how this is being received by the recepients…..I reminded me of all my fertility treatments and my useless REs and their nurses. Yes I am a “BANDIT”, breaking the rules, going my way to find my path to reach my baby and I feel proud and confident about all the decisions and the rules I make for myself. Yes it is tiring and tough but i am not one who will give up. I am not waiting for someone to tell me how to behave or act. 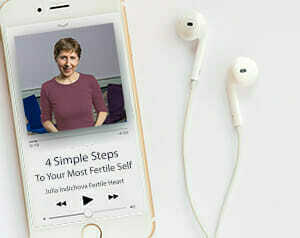 I need to share this hear because I made an appt with obgyn and wanted to speak with her about fertility options. The nurse came out and was confused when I said “fertility options” and then took a long pause and said…Ahhh you mean INFERTILITY and I said no I am perfectly fertile, I meant FERTILITY Options and I don’t want to use the word infertile. I told the doctor what I am looking for, I said IVF doesn’t work, my body hates it and I am looking for low tech options may be IUI and she was very frank and said I need to see a RE. Whoops, No way was my answer ! There is a sense of accomplishment and satisfaction when I started questioning the doctor and making it clear what I was looking for. Gone are those days when the doctor gives me crap and I take it. I will dictate my terms now on and saying this I feel so damn proud of myself. I just can’t thank you enough Julia !! I have no words on how lucky I am to find these tools which proved to be life changing. You are one brave bandit Mama, MiracleHope, S. I love that you asked for fertility options and insisted on it, wow! How is the juicing coming along? I just got a new juicer myself and am loving it. I’m cheering for you, S.
Keep following that globe of light with the baby in it, because it’s moving toward you ALL THE TIME! p.s. And I just want to add, that of course we both know and appreciate all the wonderful life-saving nurses and RE’s out there. Thank you so much Julia ! I did buy Omegavert last October and have been juicing ever since, at least 4 times a week.